روجر فيديرار has won 17 Major singles titles - the most ever by any man in history. Don Budge is the only male لعيب in tennis history to have won six consecutive Grand Slam singles titles, from Wimbledon 1937 to US Open 1938. 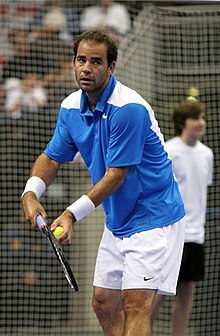 پيت سامپراس won 14 Major titles, 7 of them at Wimbledon. 14 Major titles was the world record at the time of his retirement in 2002. Bill Tilden won 10 Major titles in the 1920s, becoming the first male لعيب to achieve this feat. اندريه اجاسى was the first لعيب to complete the Career Grand Slam on three different surfaces, and the first male لعيب in history to win the كارير جولدن سلام (winning the four Grand Slams and the Olympic Gold Medal in singles). روى ايميرسون was the first male لعيب in history to win each Major title twice, and the only لعيب to have won a career Grand Slam in both singles and doubles. رافاييل نادال has won 14 Major titles, including 9 French Open titles at Roland Garros, making him the only male لعيب with nine titles at one particular Grand Slam event. 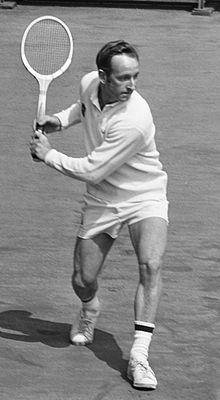 Ken Rosewall holds a record 15 Pro Slam titles, and a record 23 overall Major titles, counting both Amateur and Pro circuits. ** The French Championships opened itself to international competitors and renamed as Championnats Internationaux de France (de tennis). Note: Bold indicates لعيب still active. Note: * indicates ongoing streak, bold indicates لعيب still active. ↑ "Neale Fraser wins 1960 US Open without dropping set". ATP World Tour. Retrieved 21 January 2015. الصفحه دى اتعدلت اخر مره فى 30 سبتمبر 2018,‏ 15:56.